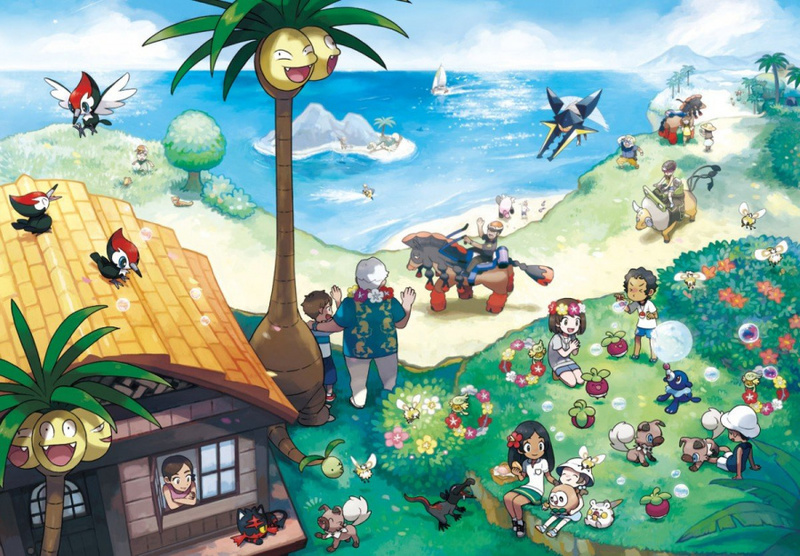 Pokémon Sun and Moon are undoubtedly the biggest hits coming to Nintendo hardware in the Holiday season, and there seems to be substantial hype around the dual release. Nintendo is making big claims about them being the biggest pre-selling games in the company's history, which shows how much appetite there is for a new generation of Pokémon. Many of you likely have pre-orders down already for retail copies, but download fans among you can get in on the act; don't forget, too, that it's the quickest way to start playing when the game launches. Pre-Load is now available for both versions on the 3DS eShop in North America, PAL territories and Japan, which means you can download the bulk of the games ahead of time and then simply trigger a very small activation download when they launch. The download, as previously reported, is one of the biggest we've seen for a 3DS retail game, clocking in at around 3.2GB. You do also get 12 Quick Balls as a gift for pre-purchasing on the eShop. Are any of you going to preload this ahead of the full release later in the month? I saw this earlier while on the eShop. I was curious about it, how it worked. You cleared that up for me though, with the downloading of the small activation download thing. I wonder if any hackers are able to predownload then break the game? Not that I condone it. For a game this big, it's worth it pre-loading. I would do it, but I'm not sure which version to get. I'm leaning towards the Moon exclusives but the 12h offset is bugging me. @ScaredyFox Yeah, but retailers often send games out early in order to ensure that you receive them on release day at the latest, so I frequently get to play them a day or two before release by preordering physically... which is even better. Makes sense if either your internet is so slow, you have data caps, or you're downloading tens of gigabytes. Plus to avoid eShop meltdown at launch. You can simply change your 3ds' internal clock by 12 hours if it bothers you that much. @Moon the files are encrypted and it's pretty much impossible to get the key afaik. No one's gonna get any info out of the preload. If leaks happen it's gonna be people who got their physical copies early at this point. @Equinox My guess would be to avoid ultimately straining the site with thousands (hundreds?) of people trying to clamber onto the site and download the games all at once. At least with this method, you have the entire game ready and waiting, you just need to jump in and out of the eshop/internet and you're done. @TheFancySquid This guy get's it. No need to worry about Gigabyte. My games are always in Physical media. "Yes our teeth and ambitions are bared, be prepared!" I'll be getting one of the two physically, but this is good for digital adopters. Still annoyed about the release delay for the UK meaning I'll probably have seen everything by the time I get it but oh well. Only buy a few things like monster hunter and AC games digital instead of physical simply because the price is too high compared to Amazon every time. I would prefer to get digital in most cases but I can't justify paying £5-£10 more each time for the convenience of easy carrying. I prefer retail preorders. Sometimes there are bonuses, sometimes the games are 2 days before the release date and... Pokemon games' money value often raises after few years (PAL Black 2 for example) meaning you may later sell it with some gain, in emergency situations. Meanwhile, one of our N3DS is broken with no option to transfer lots of digital content goodies to another system, unless we're lucky at forcing it to work, or send it to the repair which costs around the same as buing a new N3DS. Well, we could "say" that we "lost" the system and hope that Nintendo will do the account transfer to a new N3DS without the need to ship the broken one to another country... but isn't all the save data lost in that way? That is, if they respond in the first place. Never got a reply from them tbh. That situation is... quite annoying, to say the least. @FernandoMachado I have the exact same problem with Moon, I guess an easy fix would be to set the 3DS clock back 12 hours. I actually do kinda want to get the digital version this time for convenience even though the account system is still crap, but I wish there was at least a $5 discount to help make buying multiple copies more appealing. I might end up just getting it from Toys R Us so I can get 2 copies cheaper (one for me and one for lil bro). It actually also might be better to get physical considering Comcrap now has a much stricter data cap. Go over a terabyte and you pay more money on top of their already extremely, ridiculously high prices. I'm going to save my bandwidth for FF15, as I have no choice but to get the digital copy for that since my PS4 disk drive died. I wasn't going to pre-order, but I have changed my mind and will pre-order/pre-download PKMN Sun. Rapidly trying to complete my Dex for ORAS, I desperately need a Hoopa, can anyone help me? Supposedly, you can apparently get Nintendo to transfer your account to a new 3DS so that your game licenses will work, then just shove the old SD card into the new system and things should be the way they should. This is all conjecture though. @AVahne do you go over a terabyte every month? I think there's a roll over effect. One of our comcast reps told us that. We have terabytes worth of roll over. Not sure if that's true but it's what he said. I still play Destiny online and we all watch Netflix and Hulu. But we never seem to go over. Just gauge back on whatever it is you're doing. @AVahne Hey, thanks for the reply. That's what I talked about. But apparently it only works if you have stolen (with police proof) or lost system. And, from what I gathered, your save data is lost - yet, I may be wrong here as well, it's also conjecture. Supposely, if we could talk (phone call), and simply say the system is so broken there's no other way, they would do the account transfer, regardless if the system is lost or stolen. Sadly, we aren't in the same country the Nintendo residents, so the phone call is unlikely atm. And as I said, Nintendo wasn't eager to reply to my and others emails in the past. If lucky, they may send us a stock reply and ask to send the thing there. We prefer to buy yet another new system and do the risky system transfer by our own. But if the 3DS won't respond anymore, we may as well try pursuing Nintendo to do the account transfer and dealing with the possible save data loss. We have to buy a new N3DS anyway. And after the purchase decide what to do next. Either way, we are used to a such situation as it's not the first time here. There's no rush as that N3DS is broken anyway and we can use few other 3DSes we have to play physical games instead... Although, it's a bit uneasy knowing the digital purchases are locked away, with a risk of loosing them. @Equinox You're basically downloading a chunk of the game ahead of time, so that when the game is officially out, you can finish the download quickly and start playing around the same time as physical buyers. It also helps out the servers, so that they don't get stressed out with swarms of people trying to download the entire game at the same time. With NX apparently not being backwards compatible and no mention of transferring downloads I'm buying a cart this time. Aye, seems to be a big problem with Nintendo's "account system". Wish they would modernize NNID or whatever it's called nowadays. At the very least it seems that at least Switch will allow for cloud saves (though they need to allow people to transfer saves to PC like Sony does with Vita). In a "normal" month, my family only uses about 700-800 GB (still dangerously close), but when it's summer and winter break and we end up babysitting relatives' and neighbor's kids, we go up to around 1.5 TB. So yeah, gonna have to do some heavy data use management because I have little to no other freaking choice for ISP in my area. And...I don't know anything about a rollover. Comcast seems hellbent on screwing me over at any possible corner though, so even if a rollover exists, I doubt I have any data to "roll over". Though thinking about it realistically, I think Comcast had a 250 or so GB data cap before this 1 TB one (before they just throttle you if you go over, now they're making you pay), so if you indeed got some kind of rollover it's probably because you've never gone over the 250 GB cap. I always go digital but Prime Members $31.99. @AVahne Naah, it's better since NNID inclusion (although I lost access to some digital games I purchased because of NNID) - because they now keep your account data and they may transfer it when asked for - in cases exactly like ours. The unfortunate thing is that, that some regions aren't... exactly well supported (if supported at all) and the whole thing still works like it's 2006 or smth. Some customers and countries are just better to invest in, from N's perspective.